Outgoing U.S. Interior Secretary Ken Salazar on Friday announced decisions on oil shale research and development in Colorado, proposing new requirements that companies prove the viability of oil shale extraction before seeking full development rights on federal public lands. If the companies can prove their techniques can produce oil and from oil shale at commercial rates, then they can pursue additional federally owned land for development, according to the decision. The department also is seeking comments on four options on the royalty rates that might be charged on oil shale production, a flash point of controversy in the 2008 plan put forward by the outgoing President George W. Bush’s administration. Salazar is slated to leave the department in late March. Sally Jewell, president and CEO of outdoor-gear retailer Recreational Equipment Inc., has been nominated to succeed him. Friday’s oil shale announcement was hailed by Michael Saul, an attorney with the National Wildlife Federation, based in Merrifield, Va. The reserves of crude oil locked in underground oil shale formations in Colorado, Utah and Wyoming have lured research and development efforts for decades. Supporters of oil shale have said the rock layers could be a significant supply of domestic crude oil — if the thick, sludgy kerogen in the rocks could be heated to release the crude oil. The U.S. oil shale resources in Colorado, Utah and Wyoming could hold 1.23 trillion barrels of oil, five times the proven reserves of Saudi Arabia, according to the federal Bureau of Land Management. But critics say commercial-scale oil shale production could harm Colorado’s environment and require too much water in a state that’s enduring drought conditions. “We continue to maintain that ‘research first’ is a necessary and sound policy,” David Abelson, the oil shale policy advisor with Boulder-based Western Resource Advocates, said in an interview with the Denver Business Journal. “[But] we also remain concerned about making available more than 650,000 acres [for commercial leases] for an industry that doesn’t yet exist on a commercial scale. Let’s see what the research leases show, and if there’s a need, at a future point, for commercial leases, let’s make that decision at that time and see what land is available," Abelson said. Of the four options on royalty rates presented Friday, Abelson said he favored having a floor of 12.5 percent ­— identical to the royalty rate for oil and gas production from federally owned land. The 2008 plan had royalty rates of zero for the first three years of production, rising to 12.5 percent over 13 years, Abelson said. There are several existing research and development leases on federally owned land in Colorado and Utah. Of the five 160-acre research leases issued during President Bush’s administration, four are in Colorado and one lease is in Utah. That lease in Utah is held by Enefit American Oil, a subsidiary of the Estonian national energy company. In Colorado, three leases from the Bush administration are held by Shell Exploration and Production Co., an arm of Royal Dutch Shell plc (NYSE: RDS.A), and a fourth held by Rifle-based American Shale Oil LLC (AMSO). The BLM issued two more research leases in Colorado in November 2012, under President Barack Obama’s administration. Those 160-acre leases are held by ExxonMobil Exploration Co. and Natural Soda Holdings, Inc.
Carolyn Tucker, spokeswoman for Shell in Colorado, said Friday that the company is continuing its research into oil shale production and it welcomed Salazar's announcement and request for comments. "They bring more regulatory certainty to our ongoing research efforts and to an emerging industry that has made great progress toward responsibility developing the vast oil shale resources in the United States," Tucker said. 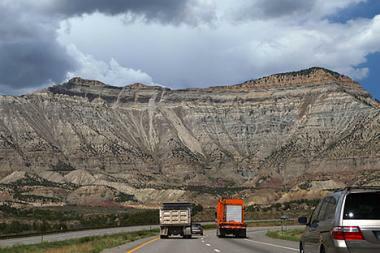 Both of Colorado's U.S. senators praised the new oil shale plan. “The Interior Department’s finalized plan for oil shale marks a continued commitment to research and development of new technologies,” U.S. Senator Michael Bennet (D), said in a statement.